I am new to the Reformed faith. Since my conversion, I have noticed a great need that I believe is not being adequately met by the Reformed circle of believers (at least here in Oklahoma). 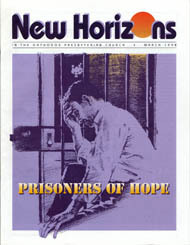 Being a new believer, I asked a friend who is not, "Why are the prisoners left untouched?" (That is, why is there minimal, if any, involvement in the lives of incarcerated or released persons by Reformed churches?) This guy has been a Reformed Christian for twenty-five years. I thought he would know. His answers, though plausible, left me asking myself the same question. At length, I came up with some answers. What if federal, state, and local social programs were to shut down? How well would Presbyterian and evangelical churches be able to handle such a crisis? It would not be a pretty picture! Sadly, I might thank the Lord for the existence of liberal churches and parachurch organizations if such a scenario unfolded. The sad fact is that Orthodox Presbyterian churches are poorly positioned to identify social trends, blueprint a comprehensive plan for a ministry of mercy, and implement such service as commanded by our Lord.